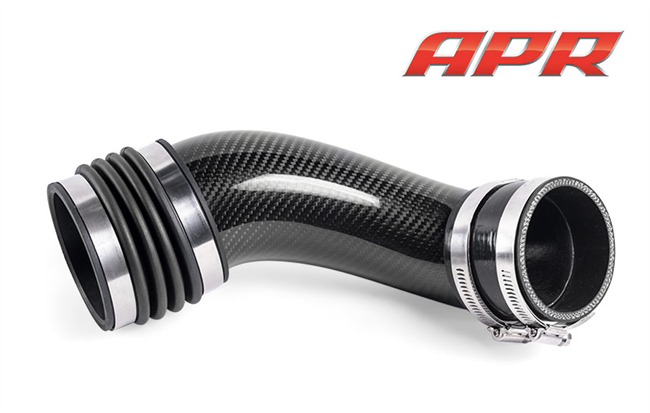 The APR Carbon Fiber Turbo Inlet Pipe replaces the rear factory plastic accordion tube with an attractive carbon fiber inlet, complementing the APR Intake System's aesthetically pleasing design. The intake and inlet hose are joined via a necessary flex coupler to allow for adequate engine movement under use without damaging the intake. The turbo inlet pipe is completely compatible with all factory turbochargers and APR's Stage III Turbocharger System.